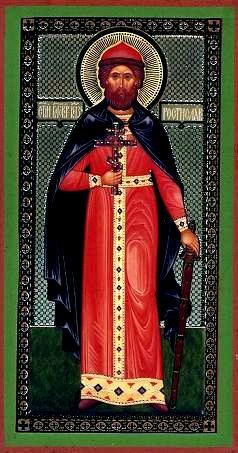 Saint Rostislav-Michael, Great Prince of Kiev, was the son of the Kievan Great Prince Saint Mstislav the Great (June 14), and the brother of holy Prince Vsevolod-Gabriel (February 11, April 22, and November 27). He was one of the great civil and churchly figures of the mid-twelfth century. His name is connected with the fortification and rise of Smolensk, and both the Smolensk principality and the Smolensk diocese. Up until the twelfth century the Smolensk land was part of the Kievan realm. The beginning of its political separation took place in the year 1125, when holy Prince Mstislav the Great, gave Smolensk to his son Rostislav (in Baptism Michael) as an inheritance from his father, the Kievan Great Prince Vladimir Monomakh. Thanks to the work and efforts of Saint Rostislav, the Smolensk principality, which he ruled for more than forty years, expanded and was built up with cities and villages, adorned with churches and monasteries, and became influential in Russian affairs. Saint Rostislav founded the cities of Rostislavl, Mstislavl, Krichev, Propoisk, and Vasiliev among others. He was the forefather of the Smolensk princely dynasty. In 1136 Saint Rostislav succeeded in establishing a separate Smolensk diocese. Its first bishop was Manuel, installed between March-May of 1136 by Metropolitan Michael of Kiev. Prince Rostislav issued an edict in the city of Smolensk assuring Bishop Manuel that he would provide him with whatever he needed. On September 30, 1150 Saint Rostislav also ceded Cathedral Hill at Smolensk to the Smolensk diocese, where the Dormition cathedral and other diocesan buildings stood. Contemporaries thought highly of the church construction of Prince Rostislav. Even the sources that are inclined to report nothing more about it note that “this prince built the church of the Theotokos at Smolensk.” The Dormition cathedral, originally built by his grandfather, Vladimir Monomakh, in the year 1101 was rebuilt and expanded under Prince Rostislav. The rebuilt cathedral was consecrated by Bishop Manuel on the Feast of the Dormition, August 15, 1150. Prince Rostislav was a “builder of the Church” in a far wider sense: he endowed the Smolensk Dormition church of the Mother of God, and transformed it from a city cathedral into the ecclesiastical center of the vast Smolensk diocese. 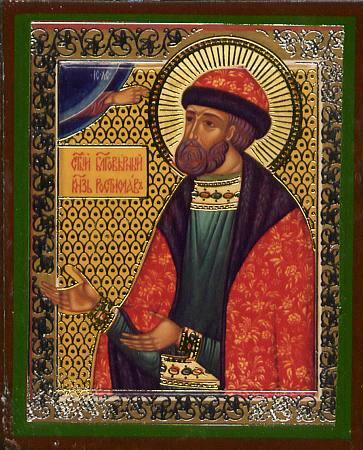 Holy Prince Rostislav was the builder of the Smolensk Kremlin, and of the Savior cathedral at the Smyadynsk Boris and Gleb monastery, founded on the place of the murder of holy Prince Gleb (September 5). Later his son David, possibly fulfilling the wishes of his father, transferred the old wooden coffins of Saints Boris and Gleb from Kievan Vyshgorod to Smyadyn. In the decade of the fifties of the twelfth century, Saint Rostislav was drawn into a prolonged struggle for Kiev, which involved representatives of the two strongest princely lines: the Olgovichi and the Monomakhovichi. On the Monomakhovichi side the major contender to be Great Prince was Rostislav’s uncle, Yurii Dolgoruky. Rostislav, as Prince of Smolensk, was one of the most powerful rulers of the Russian land and had a decisive voice in military and diplomatic negotiations. For everyone involved in the dispute, Rostislav was both a dangerous opponent and a desired ally, and he was at the center of events. This had a providential significance, since Saint Rostislav distinguished himself by his wisdom regarding the civil realm, by his strict sense of justice and unconditional obedience to elders, and by his deep respect for the Church and its hierarchy. For several generations he was the bearer of the “Russkaya Pravda” (“Russian Truth”) and of Russian propriety. After the death of his brother Izyaslav (November 13, 1154), Saint Rostislav became Great Prince of Kiev, but he ruled Kiev at the same time with his uncle Vyacheslav Vladimirovich. After the latter’s death, Rostislav returned to Smolensk, ceding the Kiev princedom to his other uncle, Yurii Dolgoruky, and he removed himself from the bloodshed of the princely disputes. He occupied Kiev a second time on April 12, 1159 and he then remained Great Prince until his death (+ 1167). More than once, he had to defend his paternal inheritance with sword in hand. The years of Saint Rostislav’s rule occurred during one of the most complicated periods in the history of the Russian Church. The elder brother of Rostislav, Izyaslav Mstislavich, a proponent of the autocephaly of the Russian Church, favored the erudite Russian monk Clement Smolyatich for Metropolitan, and wanted him to be made Metropolitan by a council of Russian bishops, without seeking the usual approval from the Patriarch of Constantinople. This occurred in the year 1147. The Russian hierarchy basically supported Metropolitan Clement and Prince Izyaslav in their struggle for ecclesiastical independence from Constantinople, but several bishops headed by Saint Niphon of Novgorod (April 8), did not recognize the autocephaly of the Russian metropolitanate and shunned communion with it, having transformed their dioceses into independent ecclesial districts, pending the resolution of this question. Bishop Manuel of Smolensk also followed this course. Saint Rostislav understood the danger which lay hidden beneath the idea of Russian autocephaly for these times, which threatened the break-up of Rus. The constant fighting over Kiev among the princes might also lead to a similar fight over the Kievan See among numerous contenders, put forth by one princely group or another. The premonitions of Saint Rostislav were fully justified. Yurii Dolgoruky, who remained loyal to Constantinople, occupied Kiev in the year 1154. He immediately banished Metropolitan Clement and petitioned Constantinople for a new Metropolitan. This was to be Saint Constantine (June 5), but he arrived in Rus only in the year 1156, six months before the death of Yurii Dolgoruky (+ May 15, 1157). Six months later, when Saint Rostislav’s nephew Mstislav Izyaslavich entered the city on December 22, 1157, Saint Constanine was obliged to flee Kiev, while the deposed Clement Smolyatich returned as Metropolitan. Then a time of disorder began in Russia, for there were two Metropolitans. All the hierarchy and the clergy came under interdict: the Greek Metropolitan suspended the Russian supporters of Clement, and Clement suspended all the supporters of Constantine. To halt the scandal, Saint Rostislav and Mstislav decided to remove both Metropolitans and petition the Patriarch of Constantinople to appoint a new archpastor for the Russian metropolitan See. But this compromise did not end the matter. Arriving in Kiev in the autumn of 1161, Metropolitan Theodore died in spring of the following year. Following the example of Saint Andrew Bogoliubsky (July 4), who supported his own fellow ascetic Bishop Theodore to be Metropolitan, Saint Rostislav put forth his own candidate, who turned out to be the much-suffering Clement Smolyatich. The fact that the Great Prince had changed his attitude toward Metropolitan Clement, shows the influence of the Kiev Caves monastery, and in particular of Archimandrite Polycarp. Archimandrite Polycarp, who followed the traditions of the Caves (in 1165 he became head of the monastery), was personally very close to Saint Rostislav. Saint Rostislav had the pious custom of inviting the igumen and twelve monks to his own table on the Saturdays and Sundays of Great Lent, and he served them himself. The prince more than once expressed the wish to be tonsured a monk at the monastery of Saints Anthony and Theodosius, and he even gave orders to build a cell for him. The monks of the Caves, a tremendous spiritual influence in ancient Rus, encouraged the prince to think about the independence of the Russian Church. Moreover, during those years in Rus, there was suspicion regarding the Orthodoxy of the bishops which came from among the Greeks, because of the notorious “Dispute about the Fasts” (the “Leontian Heresy”). Saint Rostislav’s pious intent to obtain the blessing of the Patriarch of Constantinople for Metropolitan Clement came to naught. The Greeks believed that appointing a Metropolitan to the Kiev cathedra was one of their most important prerogatives. This served not only the ecclesiastical, but also the political interests of the Byzantine Empire. In 1165 a new Greek Metropolitan arrived at Kiev, John IV, and Saint Rostislav accepted him out of humility and churchly obedience. The new Metropolitan, like his predecessor, governed the Russian Church for less than a year (+ 1166). The See of Kiev was again left vacant, and the Great Prince was deprived of the fatherly counsel and spiritual wisdom of a Metropolitan. His sole spiritual solace was the igumen Polycarp and the holy Elders of the Kiev Caves monastery and the Theodorov monastery at Kiev, which had been founded under his father. God did not fulfill Saint Rostislav’s last wish to end his life as a monk of the holy monastery. The holy prince died on the way to Kiev on March 14, 1167. (In other historical sources the year is given as 1168). His body, in accord with his last wishes, was brought to the Kiev Theodosiev monastery.